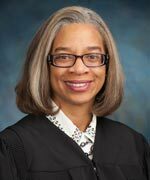 Terri B. Jamison is a Judge in the Franklin County Court of Common Pleas Domestic Relations Division – Juvenile Branch. Prior to being elected judge, she owned and managed Jamison Law Offices Co. L.P.A. Her practice focused in the areas of Criminal, Juvenile and Domestic Relations at the trial and appellate level. Terri was a Franklin County Public Defender in the Municipal division. There she represented and protected the due process rights of indigent defendants. She has experience as a Hearing Officer for the State of Ohio, Unemployment Compensation Review Commission. In that capacity, she presided over unemployment compensation appeals hearings, swore witnesses, took testimony, ruled on objections and issued written decisions. While attending Capital University Law School, she served as an intern for the State of Ohio, Bureau of State Hearings presiding over appeals hearings for OWF, Food Stamp and Medicaid benefits. She served as an extern for the State of Ohio Attorney General’s Office in the Civil Rights Section. She researched case law and drafted memoranda to support the attorneys. Before attending law school, Terri became a licensed Life & Health, Property & Casualty insurance agent for one of the largest insurance companies in the U. S. She owned and managed her own agency for more than 15 years, growing a book of business while insuring quality.